Whew - the last 2 months went by FAST!! First, this is one excellent scrap user. You make a LOT of DARK strips and sew them together. Then you make the same for light strips, and sew them together in precise configuration. 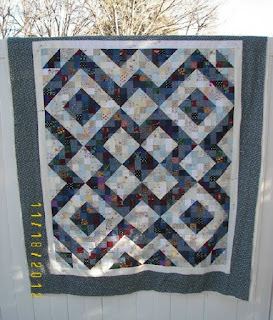 Anything goes in this quilt, just light or dark. The pieces are small so they all blend in the end. There is a lot of "process" - something I enjoy. Pressing is very important for successful abutting of seams later in the process, and Jackie Robinson's instructions were clear and accurate. Her DVD also explains "twinkle", and she also displays her own errors in color choices, which I definitely appreciated. 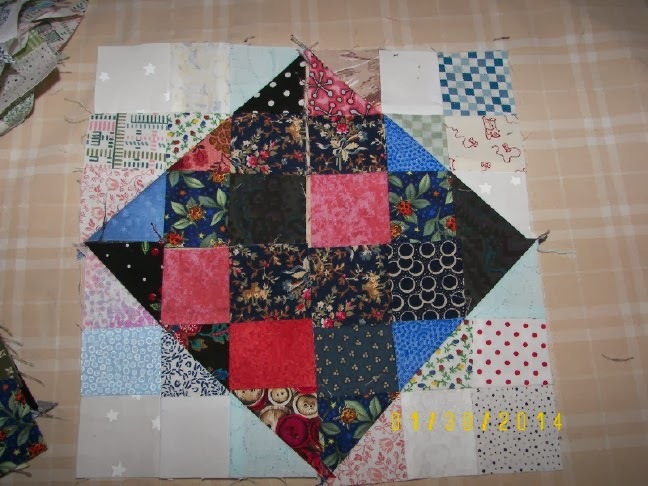 Using your triangle ruler, (note black tip on lower right extending past the edge of the black piece), cut all the 9-patches diagonally. Notice upper left - that is about 1/4 inch "off". 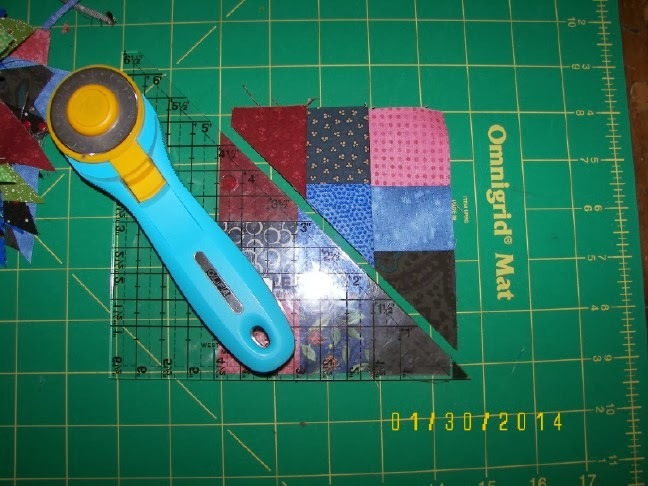 If you've cut and measured fairly accurately during the process, you will have a quarter inch seam allowance between the lower left and upper right on that diagonal cut. See ruler below. Do the same for the light units. Sew all the light triangles to the dark triangles. Matching along the diagonal is easier than it looks - there is a lot of "feeling" to get sharp points, and a 1/4 inch seam allowance is not followed. One sews from "X" to "X". I had to resew very few. Below is just one arrangement of 4 Split 9-patches. I was planning for a quilt 10 x 12 but made too many light ones, so expanded my plan to 12 x 12, but then made too many dark units. The current plan is 12 x 14, or 168 blocks. I'm close to my goal. The blocks finish slightly less than 4 inches. Can't wait to get it together - the arrangements are endless! Seems like you can't get your biscuits and gravy to come out even! Love this! I took this class from Jackie at Houston a few years ago. It was fun and she is an excellent teacher. Makes me want to do more of those blocks as I only made a small one. 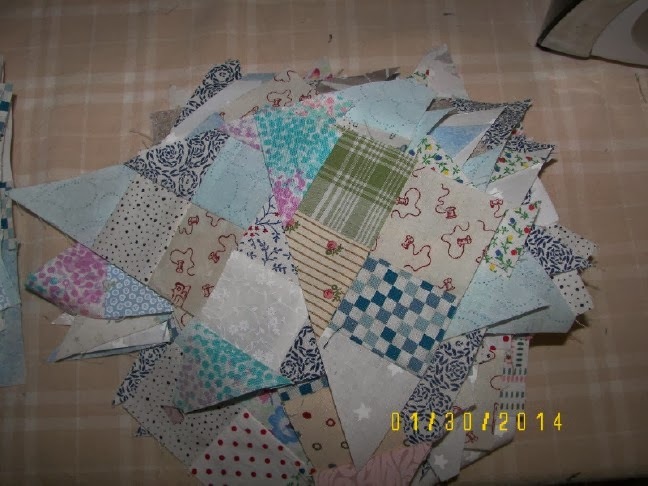 And the scrappier the better as far as I am concerned! Great job! That must be a old Southern saying. I remember my Grandmother using it. Great quilt. 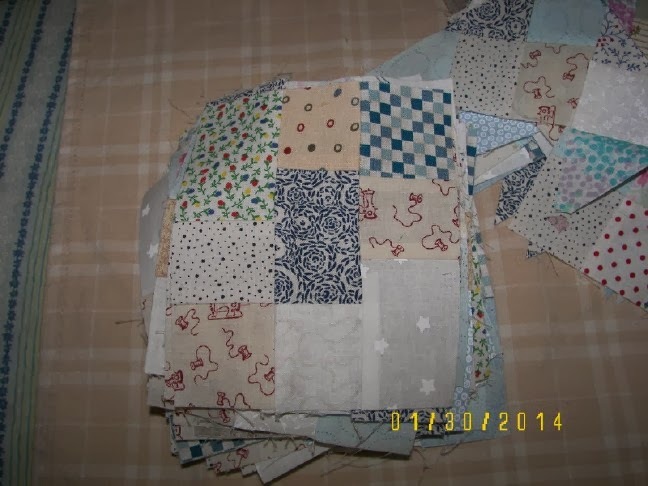 It does look like you could really use up a lot of scraps on this one. Thanks for sharing. But 4 inch blocks? Oh my! wow...I've never seen that technique, but it look intriguing! 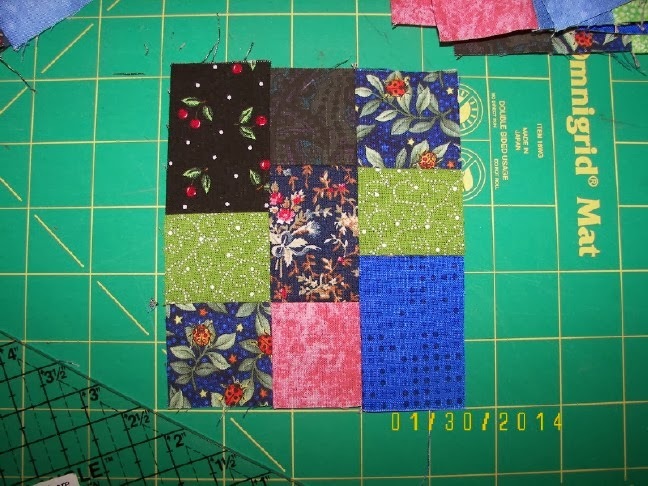 I've always loved the split 9 patch and this avoids all the HSTs! I like how you just keep making it bigger. LOL Good job!